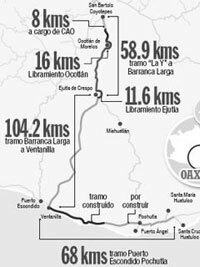 This is part of an on-going series on the new toll road from Oaxaca to Puerto Escondido which is supposed to be completed in June, 2012. The new highway will be straight - like a Roman road. Mountaintops on its path are being blown away and the debris used to fill in the ravines. 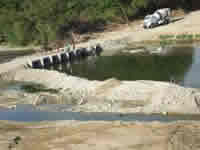 Thousands of concrete pipes were brought by truck from Oaxaca, via Sola de Vega, to Ventanilla and Colotepec to create culverts under the highway for drainage during the rainy season. There will be bridges, overpasses and underpasses. Yet everything is being done to leave the smallest footprint possible on the surrounding countryside. 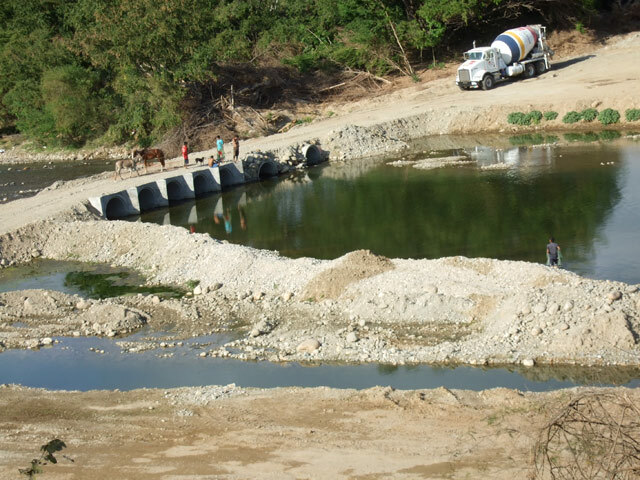 The bridge that will cross the Colotepec River near the town of Colotepec will also cross over the existing road that connects the town of Colotepec to the coast highway. Service roads had to be built adjacent to where the actual highway will be for trucks and equipment to pass. A small cement bridge that actually resembles a Roman one has been built across the Colotopec River to carry heavy machinery from one side to the other. 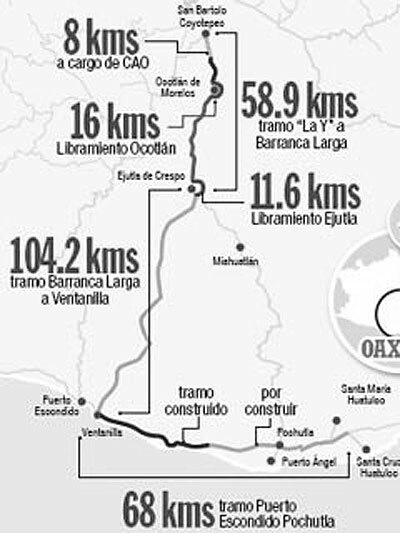 While Roman road were mainly built by army engineers, the new highway to Oaxaca is also being built almost along military lines by men “stationed” far from their homes - the workers in dormitories, the engineers share houses rented by Grupo Omega, the company that has the concession for building the highway. The engineers come from as far away as the state of Mexico; the construction workers are mainly from Salina Cruz and Oaxaca. 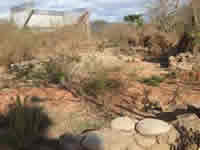 Work had been going on seven days a week, but the project stopped for the holidays on December 23 and began again in January. The one thing the highway will bend for is an archeological site. Before construction could begin, Omega had to pay for INAH (Instituto Nacional de Antropología e Historia) experts to survey the area for possible pre Hispanic ruins. One such site is between the Colotepec River and the road leading to Colotepec.